A headline in Mint Press News (Nov. 6) declared, “U.S. Police Have Killed Over 5,000 Civilians Since 9/11.” An earlier Mint article (Aug. 19) reported, “Claims of Minneapolis Police Misconduct: 439; Officers Disciplined: 0.” It is almost clichÃ© to talk about an epidemic of police brutality or the militarization of police departments. But what is occurring is a more intricate and interesting social dynamic than mere brute force. In his magnum opus, Man, Economy, and State, Murray Rothbard broke the ways in which the state controls people into three categories. Autistic intervention. The state directly restricts an individual’s use of his body or property. For example, a man is arrested for possessing drugs. Even if more than one person is arrested at the same time, the line of force runs directly from the state to each individual. No exchange occurs. It is the application of brute force, pure and simple. Binary intervention. The state directly confronts an individual in order to force the exchange of a good or service. For example, a person is sent a property tax assessment on his house or he is conscripted into the military. The line of force is still the individual but a coerced exchange occurs to the benefit of the state. Triangular intervention. The state uses the force of law to determine the manner in which two people can make an exchange. For example, an employer must hire someone at a minimum wage. Rothbard further divides triangular intervention into “price control, which deals with the terms of an exchange, and product control, which deals with the nature of the product or of the producer.” The line of force is aimed at the two people involved, one of whom may benefit from the government’s intervention. Each form of intervention constitutes a transfer or redistribution within society. Even the autistic intervention transfers power to the state and to the people in society who want drug addicts put away. All three types of force are intimately related and interactive. For one thing, all state power ultimately rests on autistic intervention or its threat. That is, the state’s final recourse to compel compliance is to lay hands directly upon an individual and take control of his person and property. Brute force underlies even the driest, most bureaucratic triangular intervention. Generally speaking, however, a state prefers to avoid the use of brute force. It will directly attack those for whom the average person has no sympathy or patience, such as drug addicts. But a prudent state will avoid inflicting direct violence upon the man on the street because it relies upon some level of cooperation from him. The state does not want average people to view it as an enemy to be resisted or evaded. So why are the police now acting like a military force that is occupying the streets of an enemy nation? A main reason for the increase in police violence is because average people are beginning to understand that all of society’s forced exchanges (binary and triangular interventions) are rigged. This has not been as obvious before, especially with triangular intervention. The farther the state moves away from direct force, the less apparent it is to the average person that any force is occurring at all. Everyone recognizes a policeman kicking a helpless man on the ground as brutality; few people recognize inflation as the economic equivalent. This is changing. The triangular interventions are becoming widely viewed as scams through which government and its cronies are feasting on the productive sector of society. They are feasting so richly that the children and grandchildren of the productive sector are confronted with wage slavery to sustain the gluttony. The problem now confronting government is that the unseen is becoming visible. The damage done by ‘services’ like Obamacare has become as evident to people as the social security check in their hands. Cronyism has become so blatant that government does not even bother to hide the raw privileges it grants, such as health care exemptions for unions. The triangular interventions through which government controls social and economic interaction are being seen for what they are: sophisticated versions of brute force and plunder. Politicians are being seen for who they are: arrogant elites who care nothing about the average person and cannot even lie about it convincingly. The great fiction of government is imploding. What is left is the great reality; namely that all government intervention rests upon coercion. The intimate relationship between the three forms of intervention is in motion. As average people begin to see triangular intervention for the fraud it is, law enforcement will increase its use of direct force to compel obedience and to create a fear of authority to fill the vacuum where respect used to be. The rise in police brutality against average people is proportionate to the loss of trust with which those people now view all government intervention. However, all but 2 of these states-Massachusetts and Illinois-have an “expectation of privacy provision” to their all-party laws that courts have ruled does not apply to on-duty police (or anyone in public). In other words, it’s technically legal in those 48 states to openly record on-duty police. Saying this while remaining calm and cool will likely put police on their best behavior. They might follow up by asking, “Who do you work for?” You may, for example, tell them you’re an independent filmmaker or a citizen journalist with a popular website/blog/YouTube show. Whatever you say, don’t lie-but don’t let police trick you into thinking that the First Amendment only applies to mainstream media journalists. It doesn’t. If you feel you’re already standing at a reasonable distance, you may say something like, “Officer, I have a right to be here. I’m filming for documentation purposes and not interfering with your work.” It’s then up to you to decide how far back you’re willing to stand to avoid arrest. Remember that the camera might still be recording. So keep calm and act like you’re being judged by a jury of millions of your YouTube peers, because one day you might be. Both apps share an important feature that allows your video to be saved if your phone is turned off-even if you’re still recording. So if you anticipate that a cop is about to grab your phone, quickly turn it off. 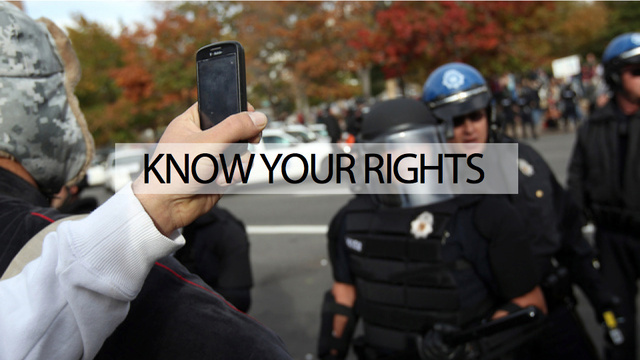 Without your passcode, police won’t be able to delete your videos or personal information even if they confiscate or destroy your phone. Cameras lacking offsite recording capability are a less desirable option. As mentioned earlier, if cops delete or destroy your footage-which happens way too often-you might lose your only hope of challenging their version of events in court. But if you can hold on to your camera, there are some good options.